Position the rack in the lower third of the oven and preheat the oven to 350 degrees F.
Line an 8 by 8-inch baking pan with foil so it hangs over the edges by about 1-inch. Spray with cooking spray. Cheesecake topping: In a medium bowl and using an electric mixer at medium speed, beat the cream cheese until smooth and creamy, about 1 minute. Beat in the sugar and the vanilla until very smooth, 1 to 2 minutes. Beat in the egg until well blended. Set aside. Combine the flour, cocoa powder, baking powder, and sea salt in a medium bowl. Combine the brown sugar and granulated sugar in a large bowl. Whisk in the buttermilk, egg whites, and vanilla. Add the chocolate mixture and whisk vigorously until fully incorporated and the batter is thick and glossy. Gradually add the flour mixture and stir just until it disappears. Reserve 1/2 cup brownie batter and set aside. Scrape the remaining brownie batter into the prepared pan. Pour the cheesecake mixture evenly over top. 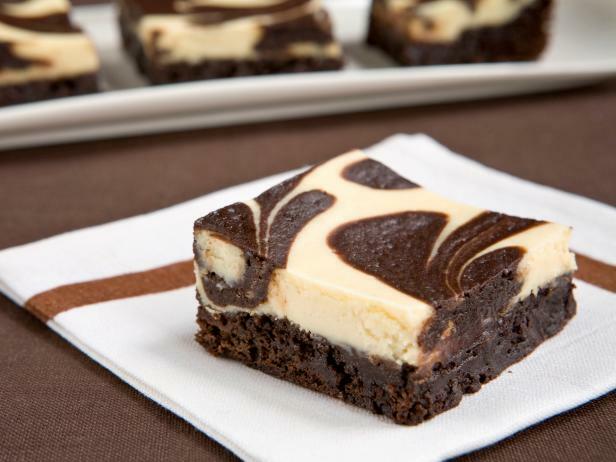 Drop the reserved brownie batter in large dollops over the topping. Draw the handle of a wooden spoon through the two batters to create a swirled effect. Bake until the top is just set, 40 to 45 minutes. Let cool completely in the pan on a wire rack. Lift brownies out of the pan by the foil and peel off the foil. Spray a knife with cooking spray and cut into 2-inch squares.